The FIFA Confederations Cup started on June 17 and will end on July 2. It is a warm-up for next year's World Cup in Russia. Soccer fans are watching the games to get a feel for what the 2018 tournament will look like. 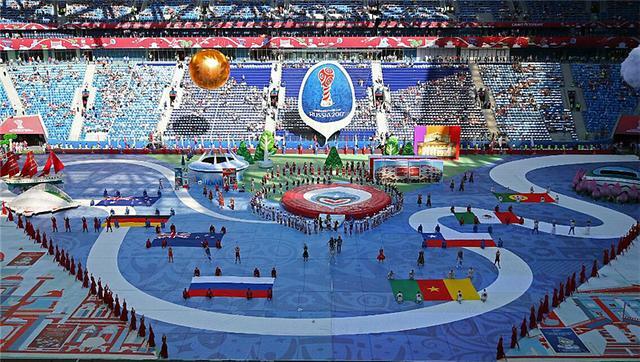 Games are being played in Kazan, Moscow, Saint Petersburg and Sochi. As the host country, Russia is playing along with seven other nations, including Mexico, Portugal, Germany, Chile, Cameroon, New Zealand and Australia. Those countries qualified by winning either the most recent World Cup or their regional confederation's tournament. The teams are divided into two groups of four. Each team plays three group games and the top two teams advance to the semifinals. On Wednesday, many people were watching the second group game between Russia and Portugal. Portugal won last year's European Cup. Cristiano Ronaldo scored a goal to help Portugal win, 1-0. The hashtag RUSPOR was trending around the world when the game started. Ronaldo is one of the best players in the world, along with Lionel Messi. Ronaldo is one of Real Madrid's star players. Anytime he plays, people watch to see how he will do. Last Sunday's game between Mexico and Portugal may have been the best so far. Ronaldo was named the best player in the game. It looked as if Portugal was going to win, but Mexico's Hector Moreno scored in the 91st minute to make it 2-2. Russia will likely need a win against Mexico on June 24 to move into the elimination round of the tournament. Vladimir Ponmarev played for the Soviet Union team that went to the semifinals of the 1966 World Cup. Ponmarev said this year's Confederations Cup will show whether Russia is ready to compete with the stronger teams in next year's World Cup. The championship game of the Confederations Cup will be played on Sunday, July 2 in Saint Petersburg. Poland know they have a chance of qualifying for the World Cup Finals. We ask for a level playing field when we compete with foreign companies. This book is divided into two distinct parts. 1.Russia will likely need a win against Mexico on June 24 to move into the elimination round of the tournament. I want you to move into my apartment. We've a spare room. 2.Last Sunday's game between Mexico and Portugal may have been the best so far.